Looking for sheets that will stay on tight, won't pill and will last for years? Your search is over. Our 100% Pima cotton 300 TC sheet sets and pillowcases are in a class of their own, manufactured In the USA by HomTex. Due to their unique, patented designed elastic corner straps and the high performance elastic, sewn around the entire perimeter of the fitted sheet, our DreamFit Degree 3° cotton sheets fit mattresses 12" to 18" thick in depth. The elastic is 4x wider and 20x stronger than standard elastic used by many other brands. Patented Corner Strap Design, Guaranteed to Fit™ and Stay On™ Mattress 12" to 18". A type of extra long staple cotton grown primarily in the south western United States, Peru, and Australia. It is considered to be one of the superior blends of cotton, and is prized for its softness and durability. Established in 1987, HomTex the manufacturer of "DreamFit™", maintains their corporate headquarters in their hometown of Vinemont, Alabama. Over the last 25 years, HomTex, still family owned, has become a leading innovator in the global textiles industry. BeyondBeds.com is an authorized retailer of the entire line of the DreamFit™ brand. 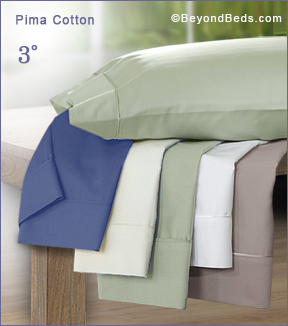 Sets include 1 Patented bottom fitted sheet with corner straps, 1 oversize flat sheet, and 2 pillowcases. (Twin & Twin XL include 1 flat sheet, 1 fitted sheet, 1 standard pillowcase).